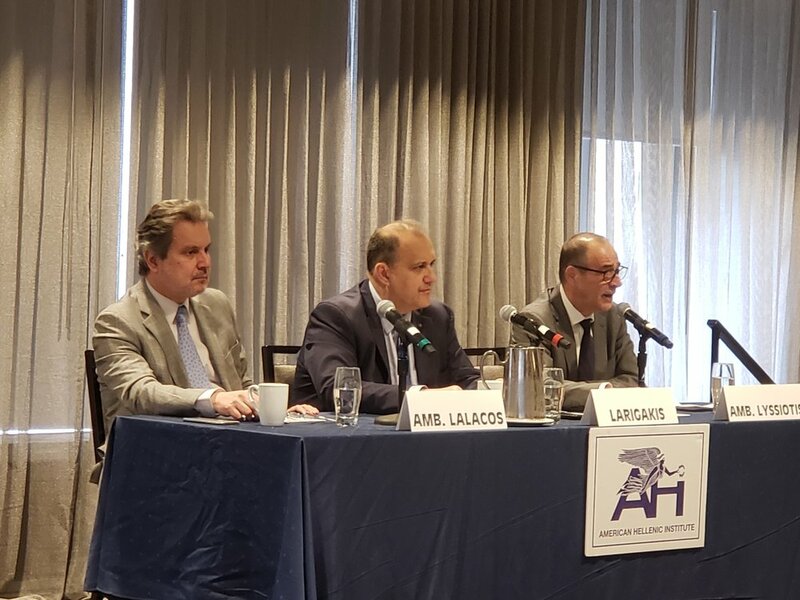 WASHINGTON, DC — The American Hellenic Institute (AHI) hosted a breakfast briefing with Ambassador Haris Lalacos, ambassador of the Hellenic Republic to the U.S., and Ambassador Marios Lysiotis, ambassador of the Republic of Cyprus to the U.S., March 9, 2019, at the Capital Hilton. AHI President Nick Larigakis moderated. In his opening remarks, President Larigakis stated Greece and Cyprus are each working to strengthen their relations with the United States amid the challenges they face from a common entity, Turkey. The ambassador of Cyprus discussed a three-pronged approach to establishing regional stability, including: active engagement in the EU, engagement in the region, and having security co-operation with countries such as the United States, Greece, Israel, Egypt, Jordan, and Lebanon, among others. Such outreach, Ambassador Lysiotis stated, creates a “reinforcing dynamic.” Ambassador Lysiotis also talked about the importance of ITAR and the need to lift arms restrictions on Cyprus imposed by the United States as well as Turkey’s continued provocations in the EEZ. Lastly, Ambassador Lysiotis discussed the urgent humanitarian issue of persons still missing as a result of Turkey’s 1974 invasion of Cyprus. Ambassador Lalacos also discussed similar dynamics. He described the energy finds in the Eastern Mediterranean as a potential game-changer in both the economic and geopolitical dynamics of the regions. He also acknowledged a “growing Chinese presence” in Greece and the Balkans, more generally. Ambassador Lalacos stated Chinese direct investment in Greece, seen in such examples such as the rejuvenated Port of Piraeus, has had a positive economic impact. Furthermore, he stated that a nuanced approach to Chinese foreign investment is needed. Ambassador Lalacos said more direct foreign investment from Western countries would be greatly appreciated, and he would prefer a variety of foreign investment in Greece. AHI President Larigakis concluded by stating that while there are still some existential issues outstanding, that the relationships between the United States and Greece and Cyprus, respectively, are at an all-time high. The ambassadors expressed their gratitude for the continued cooperation between their embassies and AHI. Newer PostCongress Praises AHI's Congressional Salute to Greek Independence Day, AHI’s mission and work.